(CNN) -- A United States soldier captured by the Taliban says in a video posted on the Internet he is "scared I won't be able to go home." Pfc. Bowe Bergdahl shown here in a video made by his captors, members of the Taliban. The soldier was identified Sunday by the Pentagon as Pfc. 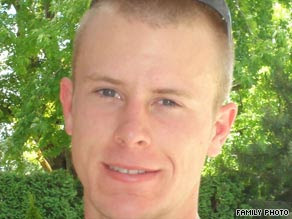 Bowe R. Bergdahl, 23, of Ketchum, Idaho. He was captured June 30 from Paktika province in southeastern Afghanistan. The Taliban has threatened to kill Bergdahl if foreign troops continue targeting civilians in the name of search operations in Ghazni and Paktika province, Taliban commander Mulvi Sangeen said by telephone Friday after being contacted by CNN at an undisclosed location. NATO-led forces in Afghanistan and the U.S. military have repeatedly denied targeting civilians. In the 28-minute video, Bergdahl becomes emotional when he speaks of his family -- his parents, siblings, nieces and nephew -- and the girlfriend he hopes to marry. "I have a very, very good family that I love back home in America, and I miss them every day that I'm gone," he says. "I miss them and I'm afraid I might never see them again and that I'll never be able to tell them I love them again. I'll never be able to hug them." He adds that he is "scared. I'm scared I won't be able to go home. It is very unnerving to be a prisoner." However, he says his captors are treating him "like a guest." It was not clear whether some or all of Bergdahl's remarks were scripted by his captors. The last few minutes of the video show him eating a meal. In a statement released Sunday through the Idaho National Guard, Bergdahl's family said, "We hope and pray for our son's safe return to his comrades and then to our family, and we appreciate all the support and expressions of sympathy shown to us by our family members, our friends and others across the nation. Thank you, and please continue to keep Bowe in your thoughts and prayers." Asked by his captors if he had any message for Americans, the soldier says, "To my fellow Americans who have loved ones over here, who know what it's like to miss them, you have the power to make our government bring them home. Please, please bring us home so we can be back where we belong and not over here." The Taliban earlier claimed responsibility for Bergdahl's kidnapping, the military said. Last week, the U.S. military distributed pamphlets in eastern Afghanistan in an effort to locate him. "As you can see, the American soldier is in good shape and good health, and he is being treated well based on the guidelines of the Islamic Emirate of Afghanistan regarding war prisoners," said a statement on Islamist Web sites accompanying the video. "Any decision regarding the American soldier will be the specialty of the high order of the Islamic Emirate of Afghanistan, may God protect him." The military said it believed Bergdahl may have been moved to various locations. In the video, he claims to have been moved from Paktika province to Khandahar, but that claim could not be verified. Asked the date, he says it is July 14. Two versions of the pamphlets were distributed in Afghanistan, written in the Pashto language. They were made available to CNN by U.S. Forces Afghanistan. One shows the image of an American soldier shaking hands in a group of kids with the message, "One of our American guests is missing. Return the guest to his home. Call us at" -- and lists a phone number. The other shows a U.S. soldier kicking down a door, and then an outstretched hand with the superimposed image of a soldier, his head and arms drooping, and the words, "If you do not release the U.S. soldier then ... you will be hunted," the pamphlet says. Days after Bergdahl went missing, a senior U.S. military official said Bergdahl and the Afghan soldiers were captured by low-level militants and then quickly "sold" to the clan and network led by warlord Siraj Haqqani -- believed to be deeply involved in the action. Bergdahl apparently left his small outpost on his own on June 30 with no apparent means of defending himself, the official said. Taliban commander Mulvi Sangeen said he visited a military post in the Yousaf Khel district in the Paktika province, got drunk, and was ambushed while returning to his car. Sangeen said the soldier was taken to a safe place. CNN could not independently verify Sangeen's claims. A source with the U.S. military denied the claim that Bergdahl was drunk. "The Taliban are known for lying and what they are claiming (is) not true," the source said. In the video, Bergdahl says he was captured as he was lagging behind a patrol. Bergdahl is not a National Guardsman, according to the Idaho National Guard statement, but the organization said it was coordinating with the Department of Defense to provide public affairs duties and other assistance to the Bergdahl family. The family has requested privacy, the statement said.